One of my resources for writers is James Scott Bell’s Plot and Structure. I read some of this book as part of my online writers classes. It’s very good, and covers a lot. What I like about this book is that he has it laid out very well, and there graphs, tips, quotes, and at the end of each chapter is a set of writing exercises. That’s what makes this book practical. In his Introduction, Bell has six tips which explain what it takes to learn to plot. (from pages 3 – 5) In later posts at later times, we’ll skim through and see what Bell has to offer – or – you can get the book and read it yourself. I’m just going give you a taste of them. 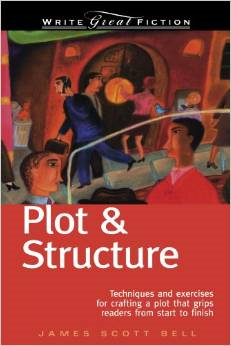 Today’s Recommended Resource: James Scott Bell’s Plot and Structure. Everything you need to know about plotting out a masterpiece can be gotten from this book. Here are the six tips explaining how to learn to plot. Get motivated – Earlier he had talked about “The Big Lie” (that writing can’t be taught), so his motivation was to overcome The Big Lie and get started. He bought himself something visual – a coffee cup that said “Writer” on it. Try stuff – Put it down on paper, leave it, go back to it, and see if you still like it. I’ve done this many times. Sometimes you like it more, sometimes, you don’t. Change it up. Stay loose – Relax. Don’t write when you’re tense, unless you want that tension to come through in your writing. “First get it written, then get it right.” – Many want to write and edit as they go, kind of like McDonald’s cleaning theory (clean as you go). It only works for McDonald’s (and it worked for Smith Organic Chocolates, too). Set a quota – I set general word quotas when I was writing Meghan’s Choice. That does help with the discipline of writing, because it is a discipline. Bell says to be kind to yourself. If you don’t hit your quota in a day, don’t beat yourself up about it. Don’t give up – I’ve heard this many, many times. Whenever you get another rejection (which I did last Friday), I’m always tempted to just give it up. So I might even say it, but I don’t mean it. Because here I am. I set a goal to three times in a week. I’m doing it, and you’re reading. I thank you. Plot is the “what happens” in a book. I buy fiction books based solely on plots I think will be intriguing. I have certain plot types I like more than others. Characters – we’ll get to them another day. Bell uses what he calls the “LOCK” system for plotting. L is for Lead. There must be a lead character. Somebody for something to happen to. And we need to care about them. How to do that is another lesson. O is for Objective. What does the lead character want? Will they get it or take something away from someone else? Those are the tips for the day. Hi Donna, I’ve read most of James Scott Bell’s novels and they’re very good. I liked the trilogy of Try Darkness, Try Fear and Try Dying stories the best. Ty Buchanan was an unforgettable character, I think because the author also told us as much about the character’s weaknesses as about his strengths. Thanks for sharing! The only book I’ve read of his is Final Witness, and I think I read it earlier this year. It’s a political intrigue type story showing the clash between sacred and secular, power vs. integrity. Towards the end, one of the major characters, even though she knows, or thinks she knows – the consequences of her decision, goes ahead and makes it anyway. Eeeeek! It wasn’t a good decision. Interesting book though. Thanks for your thoughts, Dorothy.